No, we didn’t crank up the volume on the music (although we’ve been known to a time or two). What we’re talking about is the sound that comes from the perfect mashup of our party-in-a-bus with a party-in-a-box. 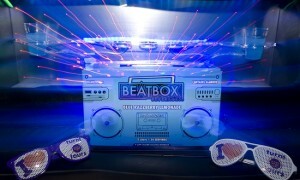 That’s right friends; Turnt Up Tours is thrilled to announce a partnership with the BeatBox Beverages out of Austin, TX. The unique and innovative company built on the premise that ‘boxed wine doesn’t have to be boring’ is now the alcoholic drink provider for all of our nightclub and dayclub tours. It all began when CEO Mike Loumos saw BeatBox on ABC’s Shark Tank and was struck with a brilliant idea. Beatbox knows that a mixed drink shouldn’t be boring! It should be euphoric, a real experience – just like music. In fact, the beverages are designed to be reminiscent of that feeling you get when the perfect song comes on that sums up your feelings better than regular words ever could. Of course, just like our #1 club crawl experience, BeatBox is “best served chilled and with friends.” With two companies dedicated to fun and experience, this really is a match made to PARTY! said Brad Schultz, CXO of BeatBox Beverages. Now can you feel the beat? Then head to Vegas and get turnt up with Turnt Up Tours and BeatBox Beverages!